In August of 1918, Metro Pictures Corporation released BOSTON BLACKIE’S LITTLE PAL, a big screen adaptation of the story which had debuted just months earlier in THE RED BOOK MAGAZINE. Starring Bert Lytell, this was the first of many films to be based upon the writings of Jack Boyle. So, it would seem fairly obvious that Bert Lytell was the first man to play Boston Blackie on the silver screen. But when dealing with a character as notorious as Boston Blackie, never trust the obvious. While Jack Boyle began chronicling the adventures of his thief-hero in 1914, the name Boston Blackie was not original to him. The moniker had actually been around at least since the 1890s, attached to a number of real-life vagabonds and law-breakers (and may have originated far earlier). Though it is virtually impossible to trace the origin of the name Boston Blackie, we can observe an interesting coincidence in timing. Boyle’s first Blackie story appeared in the July 1914 issue of THE AMERICAN MAGAZINE. At almost exactly the same time, director John G. Adolfi was hard at work shooting a film titled THE RUNAWAY FREIGHT for The Reliance Film Company. This 2-reel production told the story of a tramp who manages to make a better life for himself by securing a job at a railway station. He later discovers that two of his former vagrant friends plan to rob the station, and tries to intervene to stop the crime. The name given to the film’s tramp protagonist is Boston Blackie. 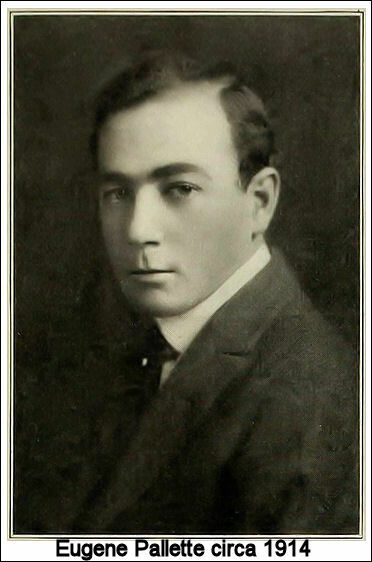 So, while THE RUNAWAY FREIGHT had no connection to Jack Boyle or his work, it still holds the unique distinction of being the first screen production to feature a character named Boston Blackie. Which makes RUNAWAY FREIGHT star Eugene Pallette cinema’s first Boston Blackie. Eugene Pallette was a busy actor in the silent era, appearing in dozens of films in the 1910s and ’20s. He successfully transitioned into talkies, and established himself as a character actor of some repute. Arguably his most memorable role was that of Friar Tuck in Errol Flynn’s version of ROBIN HOOD released in 1938. But Pallette also had remarkable turns in movies ranging from THE MARK OF ZORRO to MR. SMITH GOES TO WASHINGTON and far beyond. He continued to work in movies until the late 1940s, and passed away in 1954 at the age of 65. It’s also worth noting that THE RUNAWAY FREIGHT offers up one further coincidence for Jack Boyle fans. One of the two criminals bent on robbing the movie’s railway station was played by an actor named Sam De Grasse. De Grasse was also a prolific performer in the silent era, and in 1919 he starred in THE SILK LINED BURGLAR. The film was based on Jack Boyle’s story “Miss Doris, Safecracker,” and Mr. De Grasse played the role of Boston Blackie. A pallet was spread on the floor in the Mission attic in which Boston Blackie, university graduate, safe-cracker and escaped convict, had taken refuge after his flight from San Gregorio Penitentiary. On it lay Blackie, a block of wood supporting his head Chinese-fashion, while his long, deft fingers rapidly toasted oozy drops of opium into nut-brown smoking-pellets. The room was in darkness save for the dim light shed by a tiny opium lamp covered by a conical tin chimney. The smoker’s fingers, twirling the sizzling pills on a yen hok in the slender shaft of light above the lamp, cast gigantic shadows on the walls and ceiling – grim, fantastic, strangely shaped shadows that seemed a visible expression of the troubled mind of the man beneath them. Boston Blackie was oppressed by an unreasoning but insistent sense of impending trouble and unseen danger. His mind, keen, alert and supernormally intuitive, sought in vain to place the intangible menace. Often, it seemed, his mentality, projecting itself into the darkness about him, almost reached and drew aside the black curtain that hid the lurking mystery. But each time the unrealized vision faded and left him staring at dancing, meaningless wall-shadows. Suddenly, unbidden and unconnected with any conscious thought, a picture gripped his mind. He saw a shadowy figure, bound hand and foot and standing alone on a raised platform with head and face hidden by something dark and sinister. Boston Blackie and Mary, partner of all the hazards of his life, had taken passage for Central America on the steamer Colon. In his own country Blackie was a man with a price on his head – an escaped convict. For days he and Mary had waited for the hour of the Colon’s sailing – Blackie with keen impatience, Mary with the fierce longing of a hunted creature seeking refuge for herself and her mate. Almost on the hour of departure a steam-pipe had burst in the Colon’s engine room. Two days would be required for repairs. It was on the first of these that Blackie now lay on his pallet twirling pellets of opium, while a sixth sense warned him of danger still to be met. An hour passed. The shadows still danced on the wall and ceiling. The pills still hissed and bubbled in the heat of the tiny flame. A step sounded on the stair. “Mary at last!” exclaimed Blackie in tones caressingly tender. This *lost* sequence from “The Woman Called Rita” is just one example of the deleted material lurking within the pages of THE RED BOOK MAGAZINE, excised when Boston Blackie was converted from periodical to hardcover publication. While the 1919 book played a crucial role in making Blackie accessible to a readership for many decades, it also ensured that Jack Boyle’s original, unexpurgated texts were all but forgotten. Virtually no one has read the full-length versions of “Boston Blackie’s Mary,” “The Woman Called Rita,” “Fred the Count,” “Boston Blackie’s Little Pal,” “A Problem in Grand Larceny,” “An Answer in Grand Larceny” and “Alibi Ann” in almost 100 years. With that in mind, I’ve taken pains to return to the original magazine texts in preparing my upcoming volume, THE COMPLETE BOSTON BLACKIE. Much the way that films are often given an extended director’s cut these days, I’m working to present Jack Boyle’s extended author’s cut of these not-so-familiar stories. So, if you’ve read BOSTON BLACKIE (or even the more recent collection BOSTON BLACKIE & FRIENDS), my volume will still hold more than a few surprises for you.